The natural plantings inside the Chapel eliminate the need for expensive flower arrangements. Music is played over a professional stereo system, or you may have The Chapel Musicians play, allowing you to choose a wide variety of music. Candles on the altar are lighted for your ceremony. For evening ceremonies a Candlelight option is available. The Chapel’s wedding staff guides you from your initial contact through your wedding day including a planning conference, your rehearsal, and the wedding ceremony. One of the Chapel Ministers meets with you well before the wedding day to plan your wedding ceremony, as well as conducting your marriage service. What makes The Wayfarers Chapel so unique is that everything is provided for you. 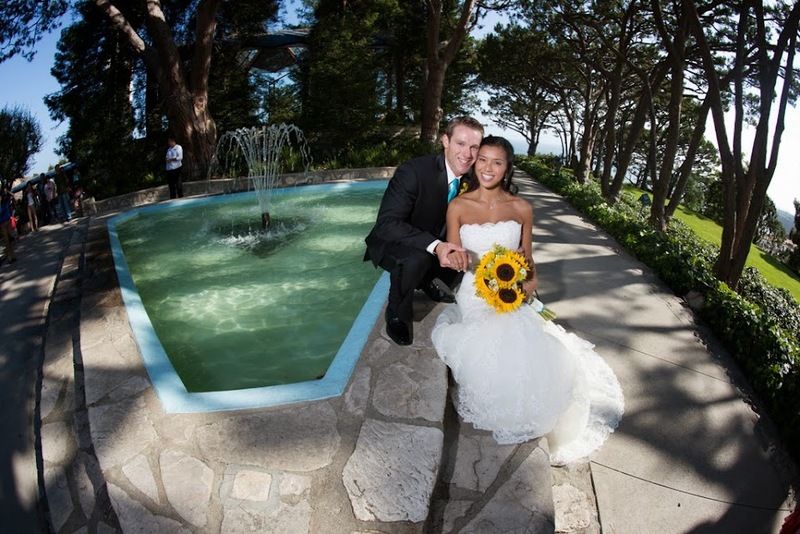 The Wayfarers Chapel is one of those places that you find on the Internet, in a bridal magazine, or know about from traveling around Rancho Palos Verdes. If you get out of your car, look at this place you will most likely be blown away by its beauty. It's on a hill overlooking the ocean. The only other place I've ever seen that looks similar to this place as far as the outside view is concerned was this winery in Maui. Words cannot explain how spectacular the view is from up here. When you step into this church you will also be amazed. A glass church, almost a large greenhouse that is also breathtaking. If you are an emotional bride and make decisions based on feelings you can easily get caught up in the moment and book this place. Your expectations will go through the roof as you have found your dream church! But here's the reality. This church is very popular and you rent it for only a short period of time. They are trying to accommodate as many brides as possible. What they tell you is you rent it for two hours, in reality, you only get it for 1 hour and 50 minutes. There is no fudge time, they want you off the property when your time is up. Show up late and you'll have even less time than you planned on. Is two hours enough time to do this place justice? Nope, not even close. But this is what you get. If you want to get married here you have to go by their rules. Their rules are HEAVILY enforced. So, you need to be the right type of people to get married here because if you expect that they won't go out of their way to accommodate you. The way they are set up, they are inflexible. The photographic potential of this place is both good and bad and depends entirely on what time of the day you book this place and weather conditions. The beach can be a pretty place, but having done thousands of portrait sessions at the ocean I know first hand that the ocean photographs the very best from one hour before sunset to a few minutes past sunset. The beautiful sunsets with eye catching cloud formations don't happen in Southern California quite the way they do in Hawaii. In order to get those types of days in Southern California, it's usually best in the winter time right after a storm rolls out of the area or one is starting to roll in (the day before a big rain when the clouds start forming is perfect). The larger risk you run into in the summertime in Southern California is that the fog is notorious for rolling in late afternoon even on the warmest most picturesque days the beach has seen all year. Grey overcast days aren't that pretty. And the fog does sometimes roll in so thick that you cannot even see the ocean. The inside of the church is nice but a couple things we need to point out about it are 1.) It's a small church. If you are going to have a large bridal party and a lot of guests you will be cramped in this church. 2). The photography takes place in the back of the church only. 3). There is no flash photography and while shooting from the back of the church there really is no way to fill in the shadows that the harsh lighting that comes through the windows creates. With all this being said the church doesn't photograph as nicely as you may think it would. The grounds are lovely. You'll want every moment to get photographed on them that you possibly can. The grounds rate a perfect ten, the church is a solid six. People are crawling all over each other to get married here. When a place is in demand like this church they can define the rules of how they operate. I used to hate their rules, I mean I just didn't think they were fair. Now I can see where they are coming from. They just want to make certain that as many people each day can get married here. I actually like this place because it's a challenge. Within 110 minutes you need to use the grounds and get married. I am fortunate enough to have photographed bridal couples over the entire grounds and know what spots work better than others. My 110 minutes on this grounds will be highly productive and will create stellar images. But just the same I know there are other really great photographers who have experience and a good game plan to photograph this venue. If wedding photography is important to you and you are worried that your photographer can't jump through hoops fast enough to make best use of these grounds either get another photographer or find another venue. Because you are going to be in an out of this venue so fast it may make you dizzy. I'm not going to say that this venue doesn't care about you. For two hours on your wedding day, they care about you and only you. But when your time is up they want you gone. "Bye bye, don't let the door hit you on the way out." The way they describe it is that they want your limo to pass the limo of the next wedding in the parking lot. You're going downhill they are going uphill. This place is lovely, it's a challenge and it can be extraordinary. It can live up to your expectations if you plan accordingly. 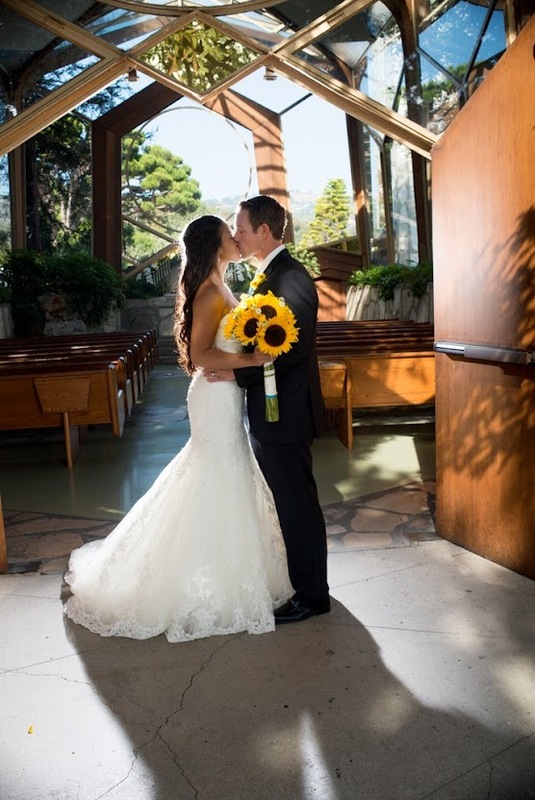 The Wayfarers Chapel is one of the most beautiful venues in Southern California. Not every bridal couple can pull it off. Are you up to the challenge?